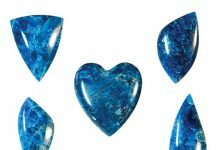 An intricate cluster of minerals from the mines of Nambia, an Imperial Topaz and a hefty 40-ounce gold nugget known as ‘Lightning Bolt,’ are among the 224 lots in the Nature & Science Signature Auction Heritage Auctions will present Aug. 18. 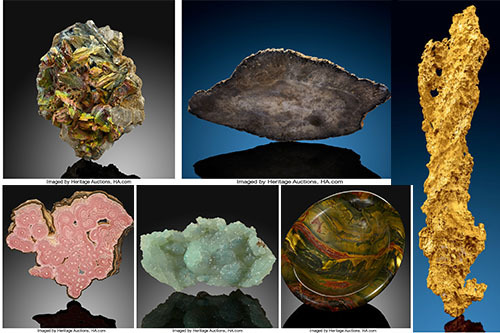 In addition to the variety of rocks, gems, and minerals on offer in this sale, I’m excited to see the sale is set for live stream presentation through Heritage Live! That means we can also tune to watch as the bidding battles unfold in real time. 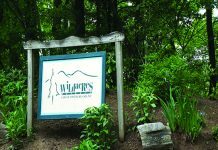 If you’ve never been to an estate auction or the like, and have a little time on Aug. 18, I would recommend tuning in to catch a glimpse of the rock and gemstone auction action. With that, I selected six specimens from this upcoming auction that caught my attention, for various reasons. Remember, this is only half a dozen items, and they are some of the pieces that I find intriguing. 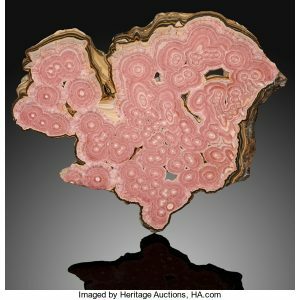 I’d love to hear what you think about the specimens in the auction and your opinion of rock, gem, and mineral auctions in general. Post your comments below or email me directly at arahn@beckett.com. Smithonsonite, Kelly Mine, Magdalena District, Socorro County, New Mexico. Measures 10.22 x 5.69 x 2.40-cm and carries an estimate of $800 - $1,200. 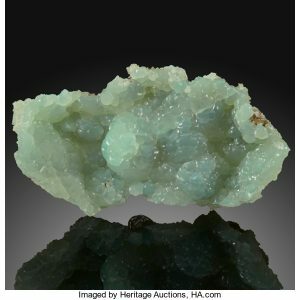 After reading many accounts of significant discoveries and dig experiences within the Kelly Mine of New Mexico, it didn’t surprise me to learn this example of Smithsonite hails from that mine. The crystallization that appears across much of the face of the mineral has a honeycomb quality, as aptly described in the auction catalog. While it is a zinc carbonate mineral, it composition often includes other elements. The presence of other elements is what causes the vibrant variety of color present within examples of Smithsonite. 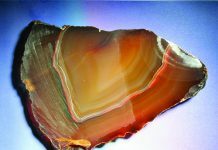 According to www.minerals.net, this mineral was named after James Smithson, founder of the Smithsonian Institution. Catamarca, Argentina. Measures 30.00 x 23.50 x 0.75 cm and has an estimate of $6,000 - $8,000. Petrified Palm Slab (Palmoxylon), Green River Formation, Gosiute Lake, Haystack Buttes, Flaming Gorge Reservoir, Sweetwater County, Wyoming. Measures 58.42 x 32.38 x 1.27 cm with an estimate of $600 - $800. This specimen caught my attention right away, although I couldn’t tell you what it was that drew me in. Then I read the lot description and the words ominous and eerie were used to describe the appearance of this slab of Petrified Palm Wood. I would agree both words are interesting and applicable word choices for this specimen and not words I would associate with most examples of rock, gem, and minerals. In addition to the description, I was fascinated to read that this slab comes from the Green River Formation – the Flaming Gorge Reservoir, in Sweetwater County, Wyoming. Gold Nuggest "Lightning Bolt," Victoria, Australia. Measures 27.00 x 6.00 x 3.64 cm and carries an pre-sale auction estimate of $70,000 - $100,000. 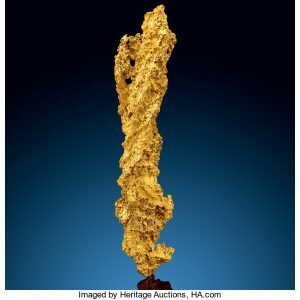 While I realize this gold specimen is viewed as a nugget, it is among the most ‘non-nugget like’ example I’ve seen. 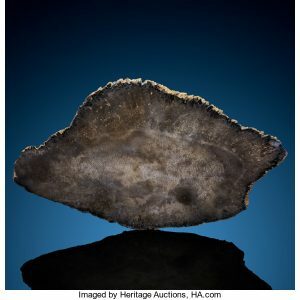 However, the ‘Lightning Bolt’ moniker seems to be more than fitting, to describe this nugget that measures nearly 11 inches in length and nearly 40 ounces. Also adding to its aesthetic is the presence of small holes. Given the history of the place where this piece was found (Victoria, Australia) it’s not completely surprising to discover that this uniquely stunning nugget hails from that region of the world. As you may be well aware, Victoria, Australia lays claim to being the location where the world’s largest gold nugget was discovered. The ‘Welcome Stranger’ nugget was discovered in the later 1860s and topped the scales at 2,284 ounces. 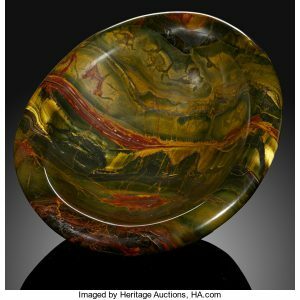 Tiger's-Eye Bowl, Mt. Brockman Station, Pilbara, Western Australia. Measures 31.11 x 27.30 x 8.89 cm with an estimate of $7,000 - $10,000. Another featured lot with an Australian connection is this carved Tiger's-Eye Bowl. 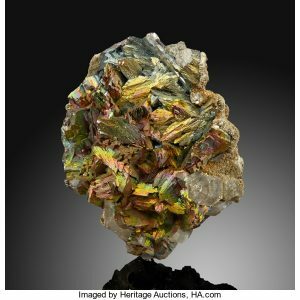 This specimen is a golden chatoyant, with Hematite, black Magnetite and large sections of vibrant yellow Goethite present, according to the auction description. The density of this gemstone is well cited, and this example fits the bill, weighing in at 17 ½ pounds. Arsenopyrite, Panasqueira Mines, Covilhã, Castelo Branco District, Portugal. Measures 6.30 x 5.12 x 2.56 inches with an estimate of $600-$800. Last, but certainly not least, is this sample of Arsenopyrite, which is an iron arsenic sulfide. 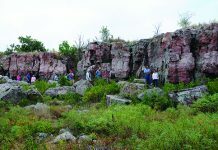 The host rock is a golden color and accented by a rainbow of hues. 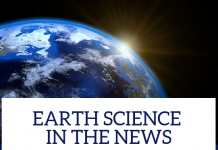 Not only is Arsenopyrite an iron arsenic sulfide mineral, but it is also the “primary ore of arsenic metal,” according to Geology.com. The mine in which it was discovered is located in the Estrela Mountains of central Portugal. To view more specimens in this Aug. 18 Heritage Auctions' Nature & Science Signature Auction, visit www.ha.com.